The TX-SR806 occupies a unique position in the Onkyo line-up. 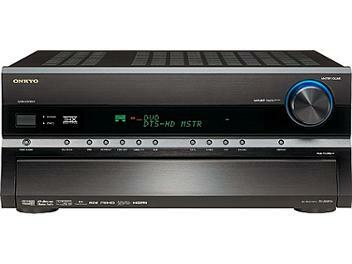 We class it as a mid-range A/V receiver. But with its advanced capabilities and THX Ultra2 Plus certification, it's a worthy challenger for high-end status. Built with high-definition entertainment in mind, the TX-SR806 accommodates up to five HDMI(tm) sources that can handle both 1080p video and studio master-quality surround sound. That's more high-def sources than you'll find on any other Onkyo A/V receiver. If that weren't enough, onboard Faroudja DCDi Cinema(tm) scales all standard definition sources to 1080p for HDMI output, or to 1080i for component video output. Endowed with the amplification power and dependability expected from an Onkyo A/V receiver, the TX-SR806 stands out as a natural choice for high-performance home theater.